This is the first piece of a four-part series on the Sacramento River watershed. The second piece discusses water rights, the third piece discusses conflict and the final piece discusses conservation. What exactly is a watershed, and why do we care? People have been drawing seemingly arbitrary boundaries on maps for as long as maps have existed. What makes a watershed particularly unique to a map is that it doesn’t care for county lines. A watershed has no use for state boundaries or national park jurisdiction. All that matters in a watershed is which direction the water is flowing. A watershed is defined by the mountains, ridges, and drainages where water first begins to flow downhill. Snowfall and rain showers on the uppermost slopes of mountain ranges begin the process of accumulating runoff, and the volume increases as it flows down small valleys, merging with other valley contents as it reaches lower and lower elevations. Each small creek is its own tiny watershed that joins with other larger ones to form an overall watershed region such as the Sacramento River watershed. While roughly 75% of the available water in California has its origins in the northern half of the state, the major demand for that water is in the state's southern half. This leads to interesting conflicts as water users in the north seek to retain the precious liquid while southern users take what they can. The Sacramento River Basin sprawls over the entirety of nine counties and into parts of 11 others. Two million acres of irrigated farmland provide rice, orchards, olives, tomatoes and vegetables to the 2.2 million people who call the region home, most of whom live in the Sacramento metropolitan area. Northern California is predicted to hit 21 million people by 2050, up 50% from 14.5 million (as of 2010). This is a huge influx of people that will naturally place a significant demand water resources. The region composing the Sacramento River Watershed started as a quiet settlement known as Sutter’s Fort on the banks of the Sacramento and American Rivers. It exploded with people upon the discovery of gold in 1848. The city of Sacramento was born as thousands poured into the region to find fortune in the hills, and the first water diversions were not far behind. With frequently devastating floods, it wasn’t long before citizens were clamoring to alter the water’s path and make it more amenable for settlers. The results of these early projects elevated the street level in Sacramento and reduced the damage wreaked by high waters. Delta levees and diversion projects in the 1850s made it possible to build the burgeoning settlement of this now massive urban area. Prior to these diversions and influx of non-native settlers, the area was home to several Native American groups, with multiple settlements on the banks of the Sacramento and American rivers. The Wintu, Nomlaki and Yana enjoyed the bounteous salmon runs of the Sacramento as a main staple. In 1848, around 150,000 native people are estimated to have lived in California. By 1870, only 30,000 remained, and by 1900 fewer than 16,000 native peoples survived as a result of disease and systemic government-sanctioned removal of populations. The Gold Rush population boom was a major player in eradicating Native Americans as thousands of settlers (both foreign and American) effectively tripled California's population. San Francisco rose in national prominence when it was declared the West Coast terminus of the transcontinental railroad, cementing the continued flow of people to the Bay Area. The gold rush was a boon for individuals seeking unfettered access to natural resources. There were no regulations to inhibit gold-seekers as they dug, exploded, and pounded the hills in search of riches. Hydraulic mining was in place until the late 1870s, and fine sediment, metals, and debris were allowed to flow haphazardly into nearby streams and rivers. Agriculture in the Sacramento Valley was impacted by this type of mining, and with heavy pressure exerted by farmers, legislation was passed in 1884 forbidding dredging, eliminating hydraulic mining, and identifying ways to limit the effects of mining on waterways. Mercury, often used for separating out the gold from ore, continued flowing downstream and into agricultural regions, causing difficulties for farmers. Mercury pollution is still a problem today within the watershed as pockets remain from the numerous large and small mines. Logging was also increased as a result of the Gold Rush. Lumber was necessary for building mine shafts, canals, and to fuel the boilers working hard at the mines. California’s huge supply of massive trees was significantly reduced as a result of the population influx of the Gold Rush. Abandoned mines still pose challenges, both from a physical safety perspective (you can easily fall in abandoned mine shafts) and from the leaching of chemicals into the watershed. Heavy metals may be present in some locations, and the number and size of every mine is entirely unknown. Mines covered the landscape during the main Gold Rush and were never fully accurately mapped. With gold no longer the driving force in Northern California, agriculture now dominates, pulling in gross cash receipts of $43.5 billion annually statewide. Technology, particularly the biotechnology fields, has become a powerful economic force along with manufacturing and shipping. Recreation is its own powerhouse economic driver in the region. State parks see nearly 10 million visitors combined, while Lassen Volcanic National Park and the Whiskeytown-Shasta-Trinity Recreation Area adds 1.5 million visitors yearly. The influx of revenue that these visitors bring to small towns cannot be understated. Over $100 million annually comes from the Sacramento salmon fishery, and more than two-thirds of those salmon originate in Sacramento waters. While stocks of all salmon populations are declining drastically, winter-run Chinook salmon are federally listed as endangered, and spring-run Chinook are listed as threatened. Fall-run Chinook are the most important in terms of numbers and value to sport and commercial fisheries, however; these are listed as species of special concern given their declining numbers. All migratory fish require healthy rivers and estuaries to maintain populations. With numerous dams blocking fish passage in the Central Valley, water is released with little regard for fish. Instead it is timed primarily for human needs like agriculture and hydro-power generation. Salmon attempting to migrate to the ocean must find their way through both the delta and San Francisco Bay twice. 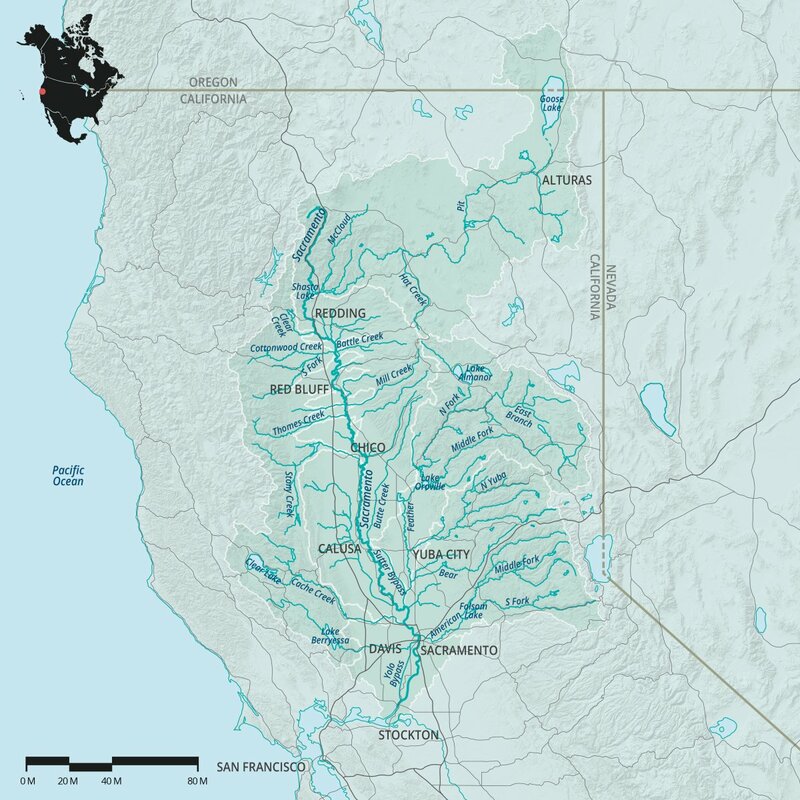 As half of the watershed runoff is diverted away from rivers, or exported to Southern California from the delta, salmon habitat is degraded significantly. According to The Bay Institute, in nearly every single habitat at every single stage of development, levees and dams have removed salmon from the waters they need. Organizations like The Bay Institute (part of the larger Bay.org) and Sacramento River Preservation Trust (SRPT) are doing much needed conservation work in the watershed to rehabilitate these waterways and provide access to the natural beauty of the Sacramento. One wonderful example is the Sacramento Blue River Trail being brought to life by SRPT in partnership with the Rivers, Trails, and Conservation Assistance Program of the National Park Service. According to American Rivers, a “Blue Trail is a waterway adopted by a local community that is dedicated to improving family-friendly recreation such as fishing, boating, and wildlife watching, and conserving land and water resources.” The goal of the Sacramento Blue River Trail is to provide access to “thousands of acres of public lands that have been purchased, protected, and in some cases restored to natural habitat,” states SRPT. It's a laudable goal. Public boat launches, camping, biology, and natural resource information will all be highlighted on the guide. Deconflicting all of the various water uses in the Sacramento watershed creates challenges for area resource managers. Depending on whom you ask, different priorities are emphasized. This is in parts, geographic, historical, and political. Discussing water rights is a sensitive subject in concert with conservation in California. Efforts by recreationists and conservationists to protect habitat for fishing or endangered species often conflict with agricultural requirements. Our following piece will dive into the murky issues of irrigation, diversion, and the history of water rights. How do the people of the Sacramento basin prioritize use? Join us as we continue to examine this major Californian watershed.